Intro from Jay Allison: Much of Transom's content is about the HOW. How do you make a good story in sound? The part that flummoxes new producers is boiling down all that "tape" into a coherent essence. In many ways, process becomes product. Do you use legal pads, transcripts, index cards, diagrams, nothing but the sound and your brain? Each method will affect the outcome. In the 1970s when some of us started this work, we used 10-inch reels and filled the edit room with them, each one leadered up with a snippet on it and a grease pencil label on the reel. Things have changed. In this new feature, producer Luke Quinton lays out a wonderful array of techniques, including transcribing from WITHIN your digital editing software. He runs down the tricks of Snap Judgement, Radiolab, Love + Radio, This American Life and other shows to give you a starting point for customizing your own approach. You can waste a lot of time in this part of the build, constructing sub-basements no one will ever see. Some of these tricks will help you just get it done. When I came into radio as a print reporter, the idea that you would start from a transcript seemed to make sense. Transcripts were what I was used to: taking a ton of quotes and cutting and refining until a sleek, streamlined story emerged out of the clutter. I was doing spots and short features, and even with massive 14pt. type, scripts were only two pages long. So tape logging was fine. It did the job. But as the stories became longer and more complex, I found tape logging, typing a transcript or logging tape in shorthand with timestamps — as you’re taught from NPR affiliates and almost every show — seemed increasingly awkward. As a print reporter, I have all kinds of tricks to help figure out what the story is without gulping from the firehose. I hand-write notes on the fly, a process that trained my ear to jot down only the best quotes and most vital detail. Then I write the first draft in longhand. When it’s time to type it, your brain sees the story afresh; you’re primed to revise the piece while you type. In radio, I was searching for the equivalents of these tricks. About a year ago I’d collected three hours of highly detailed tape that I was desperately trying to pare down for a story on Snap Judgement. I got to 50 minutes but that hurt. Getting to 30 felt like a mortal wound. 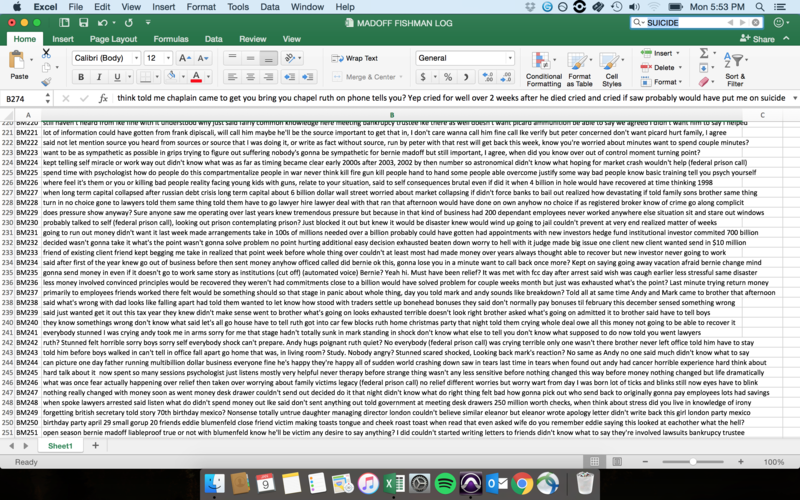 I had transcribed the entire interview, with timestamps, and it was an important crutch as I sifted for tape. Yet as I went from the tape to the transcript to my DAW (digital editing workstation), I found myself drowning in the story. Losing track. It just seemed as though there should be a better way — if this makes sense — to edit directly within the sound. And as it turns out there is. Sort of. I started hearing from friends and colleagues that Radiolab had developed its own tape-logging method. This Radiolab screenshot (above) shows the basic idea. (Click to enlarge it). See where it says “BM That is out of wack”? They have logged the interview by using the text field of each clip, and typed inside there, as you would a word processor. You type either the full verbatim transcript, or at the very least a group of key words, so that the log is glued to the clip itself. Pro Tools session for Ponzi Supernova. 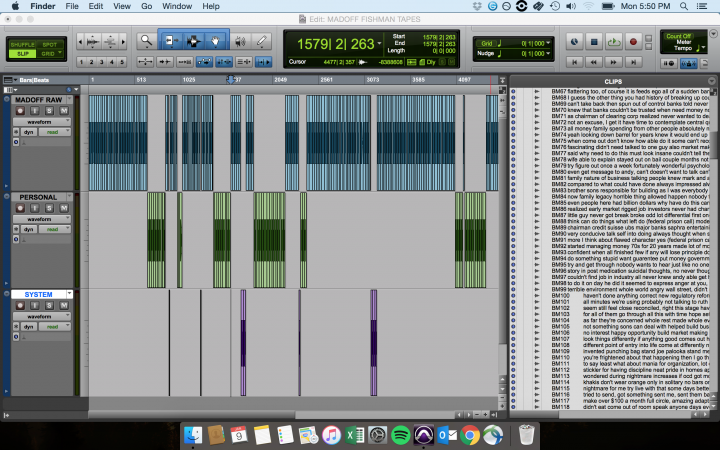 This is a screenshot of a Pro Tools session for Horne’s show Ponzi Supernova. Notice, the clips bin on the right? Instead of just logging titles and keywords, in this method the clips bin essentially holds the transcript. (Click to enlarge). The transcript itself is entered inside the DAW. So, give the clip a title — like BM274 above (“BM” presumably for Bernie Madoff, “274,” for clip number 274). You listen to the tape, and as you listen, you transcribe the words of the interview into the clip itself, after you’ve typed in the clip number, like BM274. When you hear a natural stopping point (say it’s a new question, or the subject changes) or if it’s getting too long, split the track at that point, and start on the next clip, in this case BM275. “You click group the whole thing — then you hit play, and you’re listening. The first version you’re very loosely transcribing (inside the title field) — but you’re trying to move fast so there’s a lot of shorthand stuff, but (you’re) making a point of actually using keywords.” These keywords will show up later in a search. “When you got to something that felt like a natural point,” he says, “You hit Cut, then . . . all your words of that chunk, maybe it’s 30 seconds, maybe it’s a minute, you just look for some kind of conceptual spot for a cut.” That becomes what Pro Tools calls a Clip Group, labeled, say “BM1,” “BM2,” “BM3,” and then behind that, inside the text field of each clip, comes the transcript. Most (or maybe every) DAW has some sort of clip bin. Yet not every clip bin has a search function. In Hindenburg, for example, you can type your transcript into the title space of a clip, but can’t search for it later. This is when it’s helpful to take the next step. No matter what DAW you use, if you transcribe inside your audio software, you can set up a labeling system in a spreadsheet, or even a word doc, and paste the text of each new clip/select there, along with its corresponding number. It also works the other way around, if you paste the transcript into the text field of your clip. If your DAW doesn’t let you search for text, there are still some benefits. This is a very zoomed-in shot of a tape log in Hindenburg. Yes, you have to copy and paste the text into a word doc later so it’s searchable, but how about the visual reinforcement of having the words right in front of your eyes, while you’re working inside the session, listening for selects to pull or for new tape to add or cut? Until the computers start doing all this for us, I’ll take it. A tight zoom of two overlapping clips with tape logged inside Hindenburg. How Does This DAW Transcript Help? Audio is an invisible medium. Literally every other medium has a visual component, except this one. That’s the magic of radio, but also the frustration. But for anyone who’s had a pure paper edit, the truth is: They don’t work. They’re not native to this medium. Nubar Alexanian:You do these interviews and the tapes are transcribed, the film is transcribed to audio. You edit from there, no? Errol Morris: No, I don’t edit from the transcripts, ever. I edit from the film. We transcribe the material, we write in time code, and it’s a way of creating an index for the material. While you’re editing you can quickly find pieces of material from the transcript and in the transcript. EM: Paper cuts? No, never, never. Paper cuts give you a very false idea. “It’s almost like I grew up in the weird family — it was the thing I needed and I never did it the other way,” Soren Wheeler told me. I reached out to a bunch of producers to find out how they work with, and log, tape. And for those of us constantly staring at the limited screen space of a 13-inch laptop, how about this for a novel ideal: “(We) also keep running notes on paper as we listen and label into Pro Tools. Never Abandon The Transcript Altogether! “A few years ago I worked by labeling chunks of tape directly in the DAW (Reaper in my case), and would rarely use transcripts. But over time, I’ve found that working this way exclusively (logging only in the DAW rather than supporting it with transcripts and text scripts) was too limiting, and wound up bogging me down somewhat in the later stages of an edit. And there are ways to do great work with paper. 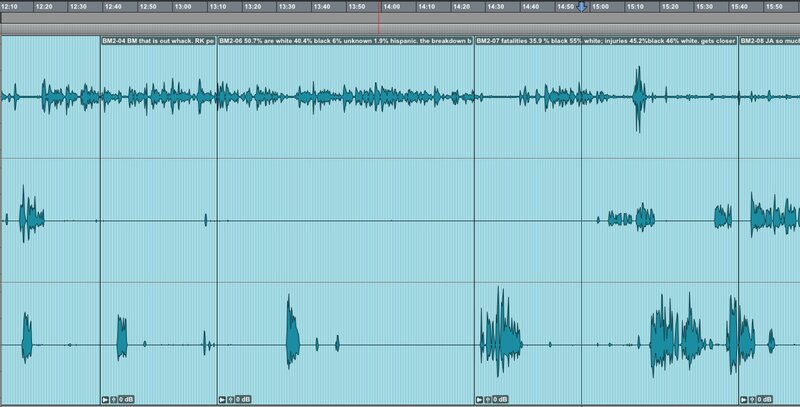 This American Life, from all reports, gets around the potential pitfalls of a paper edit by bringing in the ears of new producers to listen during each round of editing. It’s important to note how widely this Radiolab method has proliferated. It’s used at Reply All, at Ellen Horne’s Ponzi Supernova, at Invisibilia and a bunch of places that are now staffed with former Radiolab staffers and interns. At Radiolab, Horne says, “the interns are logging tape — that’s also why it proliferated through the podcasting world.” It became a training pipeline for this alternative method. But both Horne and Wheeler offer important caveats. “I don’t think that it’s more efficient than transcription. Actually I think it’s wildly inefficient,” Horne says. In a thriving shop with a team of interns, it’s worth it. And Horne says it was useful for their Madoff show because its serial nature meant there were clips they would be returning to again and again. For solo freelancers or small teams? Maybe not. Fetishizing these methods can be remarkable tools of procrastination. Does this tape-logging method make it easier to cut hours of tape to 18 minutes? Ultimately you have to know and own your story. 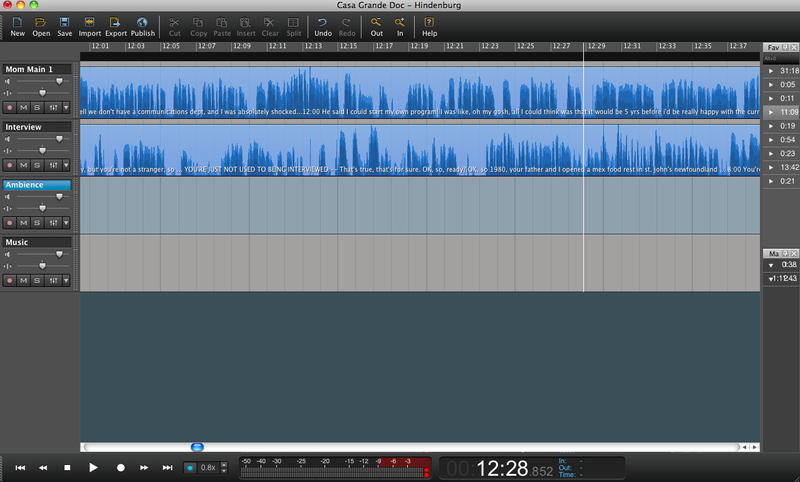 Still, a more visual set-up inside of your audio software makes intrinsic sense to me. Ironically, at More Perfect, the process had been updated once again. They now start backwards. They have transcripts made, with timestamps every fifteen seconds. Then some patient person/intern cuts up the raw interview into the corresponding fifteen second intervals, and pastes the text into each clip so it all lines up. What’s the easiest way to write better narration? Don’t write it. Try saying it out loud. Invent it out of the air. Newsrooms teach you to write tracks in short sentences that make sense the first time you hear them. At Snap Judgement, producer Joe Rosenberg has a super smart way of tracking: He records scratch tracks directly into his audio software. Once he has selects lined up, he creates a gap (silence) in between them, and thinks his narration out loud, into his computer’s mediocre mic. “Because you’re listening to the tape that preceded it, your tone is going to be correct,” he says. “You’re picking up the vibe from the tape that’s cueing you up. “That’s really been the advantage I think — you don’t really need to wait to find out rhythmically and conceptually that it works. You don’t need to do that division of labor. You put them into your timeline only to find out ‘Oh, that doesn’t really make sense.’ It helps you get to tape quickly. “And the other thing is finding out that as I’m putting these in and kind of improvising, that I can talk very slowly, that I can try to create … a sentence … like … this … and edit that down,” into something that will work for the group edit. This is what one of mine sounded like. First you hear the original improvised scratch track; followed by the group edit version with the long awkward silences removed; and then the final, edited version that made it to air. If you’re lost in the story, Rosenberg says, “If you don’t know how to write what comes next, the way to think about it is: You’re at home, you’re working on this project, and your roommate walks in — and lo and behold, before you know it,” your explanation is the narration. At some point, you get halfway decent at making radio, and that’s when you make the novice mistake: You get obsessed with the process. This is when you procrastinate by reading everything there is to read about the medium, and try to incorporate the masters’ tricks into your repertoire. I’m not saying “Don’t read,” it’s more like, “Don’t get bogged down.” What Soren Wheeler said resonates. These methods can bail you out, but they can’t fix your story. In print, I never looked at my laptop and thought, “God, this software is making my life harder!” Yet every radio producer has felt exactly that at some point. Partly that’s because programs like Pro Tools weren’t made for documentary radio — they catered to music producers! We depend on words so heavily, any way to stay close to the tape seems to help. Technology will solve this eventually. But it’s striking that Radiolab’s transcription method came while the show was being ignored; low on pressure and high on space to experiment. If anything, it’s frustrating when you get into radio and discover that so much is soft and squishy, that there’s no one right way to make a fade or to bring in music. And obviously, from the variety of tape logging methods there’s no one right way to do it. So maybe that’s the best advice for novices who get stuck: Try something new. And if it sounds good, do it. Luke is a print reporter and radio producer from St. John’s, Newfoundland. 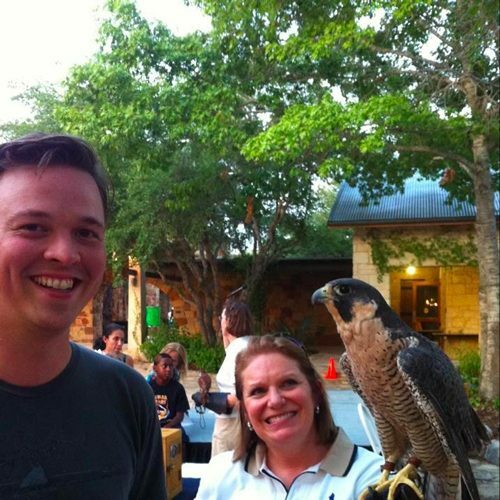 He has written about art and culture for Gramophone, Maclean’s, the Austin American-Statesman, and Dwell, and he’s made radio about Texas Rangers, weird birds, and fossil thieves for Snap Judgement, All Things Considered, PRX, and Marketplace. He lives in Austin, Texas, where for some reason he still doesn’t own a decent pair of cowboy boots. You can learn more about Luke at his website. Wonderful post. One thing that I do that has helped me get the ball rolling on my pieces is logging by hand on a legal pad. The first line is 0:00 the second line is 1:00. and I just write the main ideas of each minute. Sometimes I write nothing at all on a line if the tape is boring. Whenever something pops or I laugh out loud or gasp etc., I draw a star to the left of the line—sometimes two or three stars. Then when I do my initial cut—in Hindenburg—I just pull the starred sections and listen to them together. There’s details to fill, but because of the way I narrate I can say most of them. However I do pay for a transcription service that I just plug my tape into and out pops a timestamped mostly correct transcription. So when it comes time for a subject to say a little technical detail I can search for it, find it, and put it in quickly. Also I am totally reading this instead of working on a piece that’s due at the end of the week. Caught me. I’m so glad I read about your method before I started. I’ve got stuck doing word by word transcription before and oh man is it tedious. By real time jotted highlights per minute mean I can enjoy listening back to my recording and let myself respond emotionally to what was said, rather than be clinically precise. Thanks, Jakob … I love that you use pen and ink — and using lines as timestamps. Brilliant. I remember the writer Dave Eggers once asked why people were so happy with the 13 inch landscape of a computer screen, when print just had so much more room to experiment. (He was putting out a massive broadsheet newsprint edition of McSweeney’s at the time.) And I think we’ve all felt a little claustrophobic scrolling scrolling scrolling through a transcript or trying to find tape we buried at the 2hr mark of the audio editor! I never transcribed. It doesn’t catch the ‘sound’ of the tape. 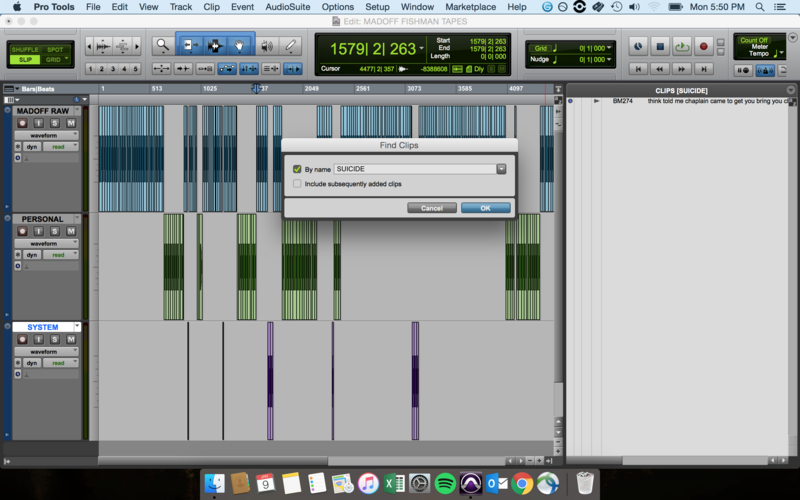 I guess I worked ‘backwards’ by listening for my ‘big moment’ first, editing that and putting at the 3/4 mark. Then I’d go for my opening scenes where we ‘level the playing field’ for the audience. Then I’d fill in the gaps. All this by ear. It worked for me and got me some New York ‘Golds’, etc. Each to his own…but I hated the idea of NOT ‘hearing’ the sound of the words. That’s really helpful. Thank you. On some bigger projects, I bring in a chair. I put scenes/quotes/stories on separate index cards – lay them out on the floor in a sequence. Then, I stand on the chair to get it all in view – bigger than a computer screen or even a widescreen TV. It helps you see the flow and possible connections. Wow, Ronan, that’s amazing. The chair! Also, seems like a serious reminder of how limiting the software can be. It’s just another tool. I also use a German transcription programme, F5, which time stamps the text when you hit the Return key. Great article. Thanks for sharing! It’s good to know how experienced producers tackle transcription. I’m still starting out in producing pieces, and I find it to be the most soul-crushingly long task for any particular story. I’ll try one of these methods with a future story. Yeah, if I get your question, using the title field is a good bet. You can click on the track and press enter and that should open the text field for a specific piece of tape. I’ve always used HyperTranscribe but would like to move towards the ProTools method to make diving back into the actual editing a little bit more streamlined. I began trying this method this morning but quickly ran into the issue of reaching character limit in the protools file naming that forced me to break up the clips in less-than-ideal locations. Does anyone have any idea on ways around this?